These fine strings which looks like rice noodles are hand woven strings. Click on the photo and you can see the details of the knots carefully tied together. 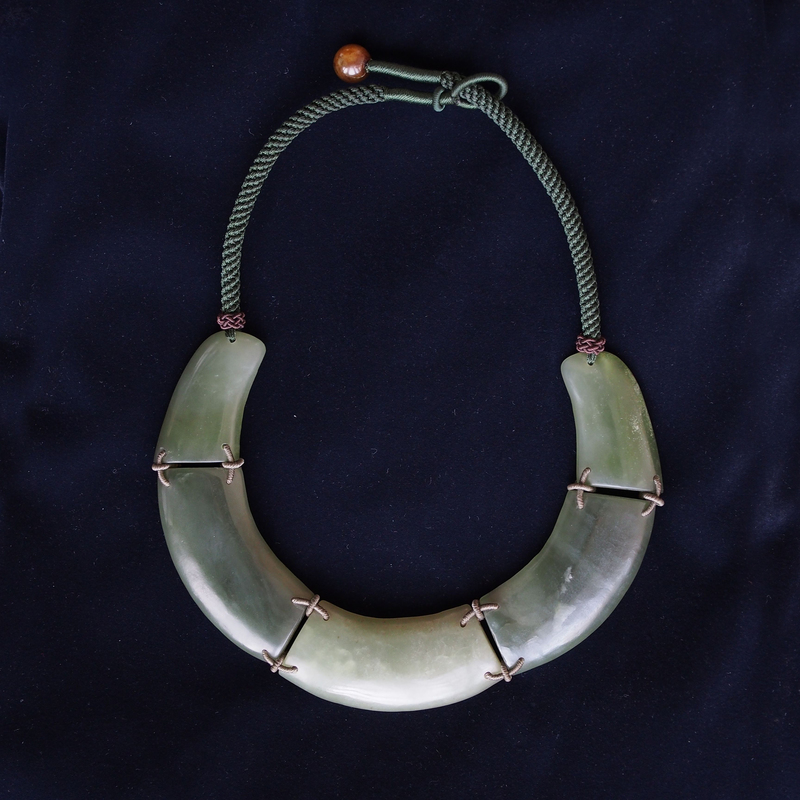 The jade pendant of the necklace came from the form of an ancient head piece. 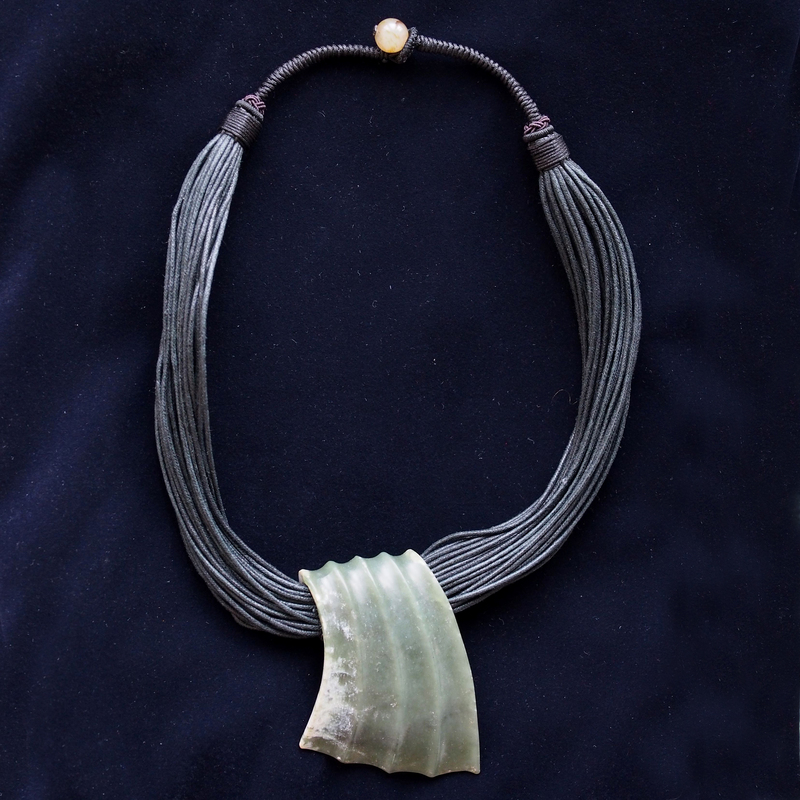 A beautiful jade carving pendant of a Tao Tie with a yu bi hanging from his mouth. Bi Xi, one who like carrying heavy stuff and often found with a stone tablet on his back. Chi Wen, one who enjoys the vista, often found one the ridges of buildings. Pu Lao, love music, found on bells. Bi An, one who hates criminals, found on the lintel of the prison. Tao Tie, one who loves to eat, found on lids and the side of cauldrons; sometimes found on the middle of the beam, it is believed that he can drank all the water and keep the flood away. Gong Fu, love to play with water, found on bridges. Ya Zi, a fierce creature with weapons. Suan Ni, loves smoky fire, found on the lid of incense burner. Jiao Tu, hates trespassers, oftern found on the main door. This mythical creature, the fifth son of the dragon, is one who loves to eat made a perfect ornament for festive season. 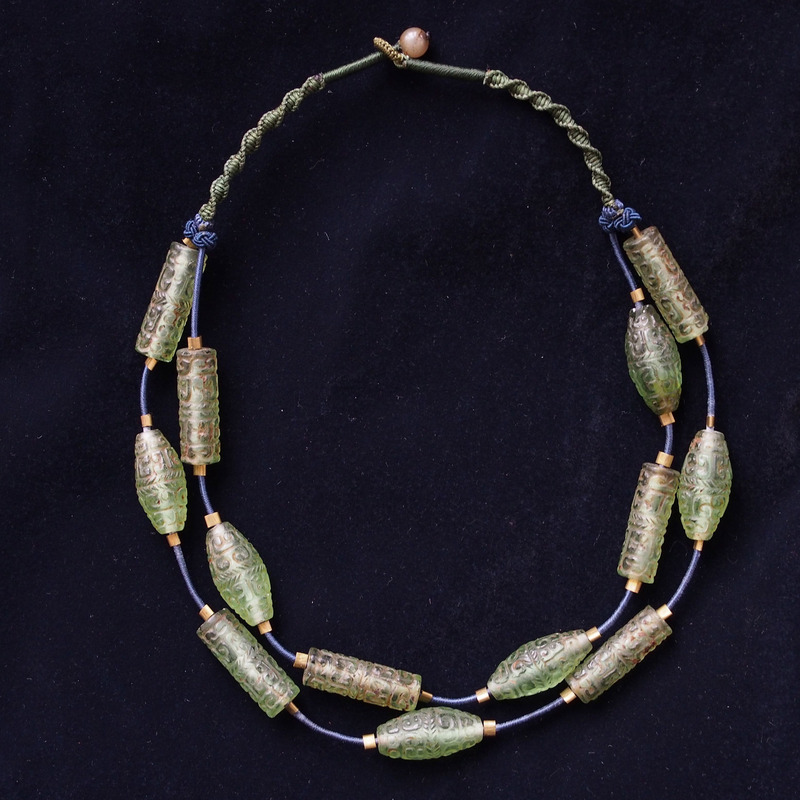 A hetian jade butterfly pendant on beautifully hand woven necklace. The pendant is of a different version of the Ye Le Li featured earlier in the blog. 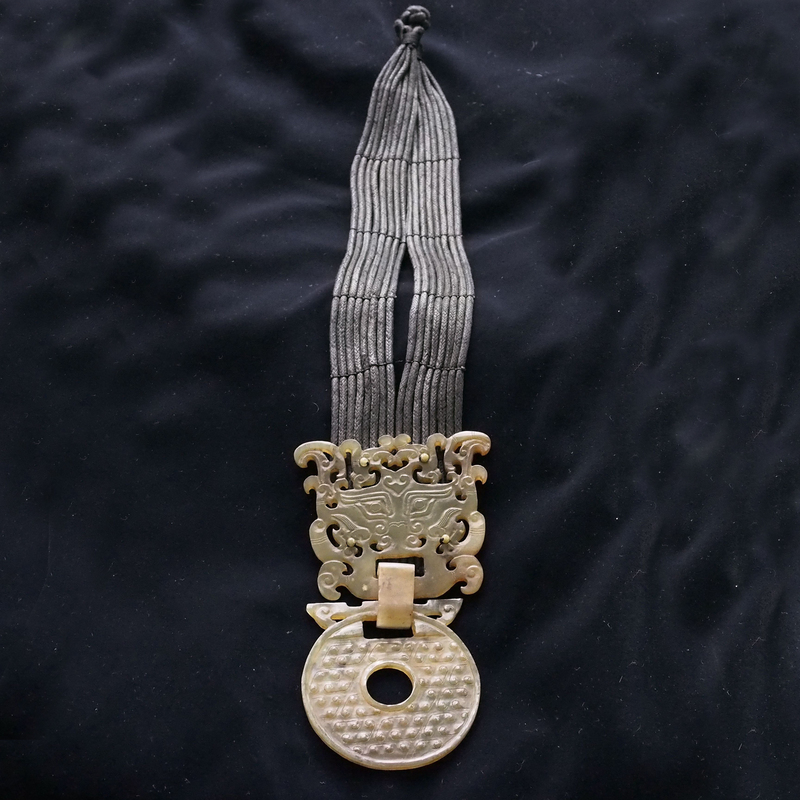 Ye Le Li was used as a status identification object, a decoration that is hang by the waist. Yu Bi is a form of jade that is used for ceremony, like the jade huang it is one of the 6 forms of jade that is used for ritual ceremony and later identification. 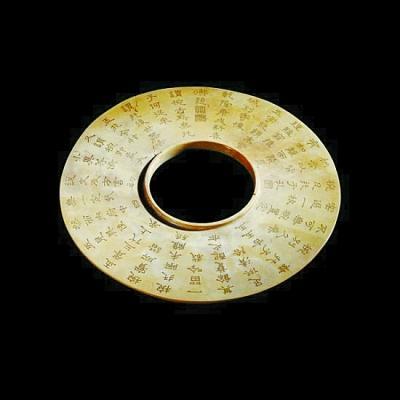 Yu Bi generally describes a piece of circular jade with a hole in the middle, as they sometimes come with pattern, this particular would be known as a Su (plain) Yu Bi, its being raised up in the center is known as a collar hence You Ling (collar) Su Yu Bi. This form of Yu Bi was for the late Shang dynasty, like the iphone in the 20th century, it was an high tech object, a status symbol that became so popular that it can be found in various parts of China. This is Emporer Qian Long’s favourite, he wrote several poems about it and asked for the poem to be engraved onto the jade. The item is now part of the British Museum Collection. The creature of the pendant is known as a “Tao Tie”, in mythical legend he is fifth son of the dragon. The Tao Tie has the face of a goat and the body of a man, he has eyes under his armpits, teeth of the tiger but the voice of a baby. The Tao Tie is said to be a greedy eater and thus his images are found in a lot of bronze cauldrons, even the gourmet experts are referred to as old Tao. 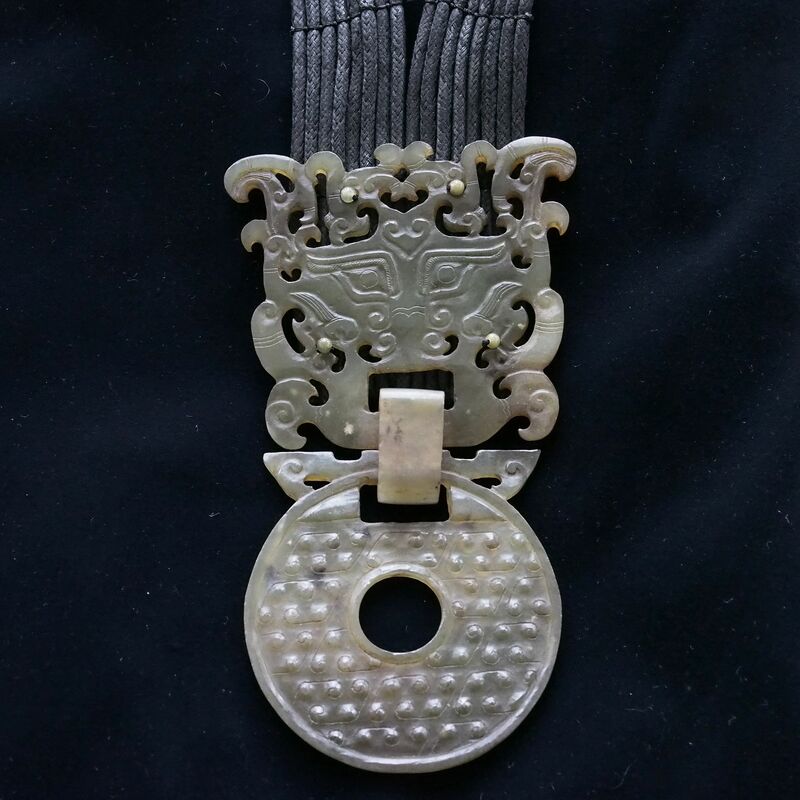 Jade huang is one of the six forms of jade used for the recruitment of the court, a little bit like the staff identification card of today. Each form and its different material would represent a different grade in the court. 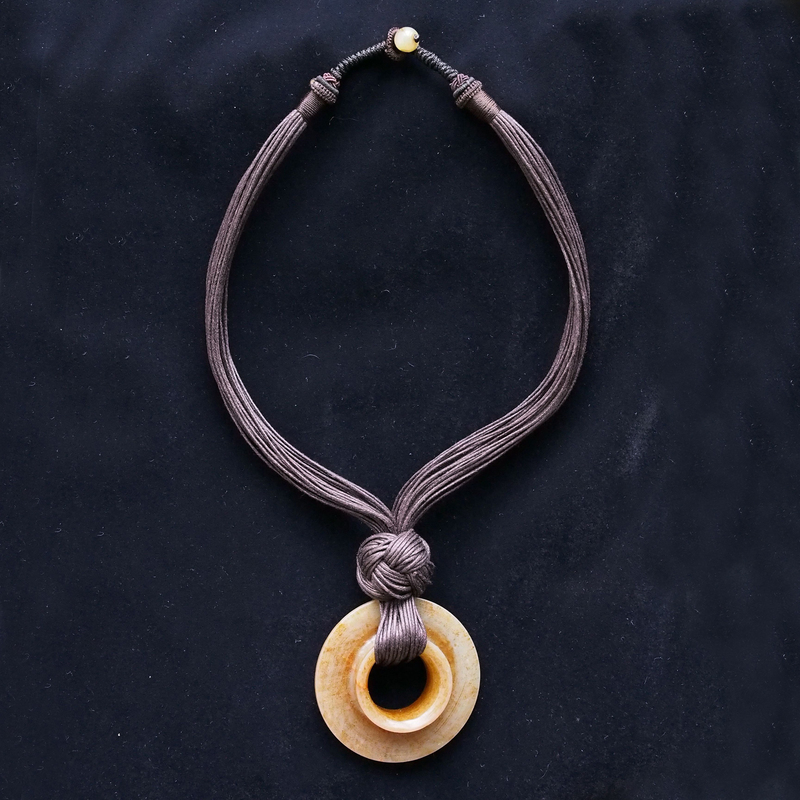 By the Shang dynasty, it is more of a decorative object worn over the chest as a pendant. 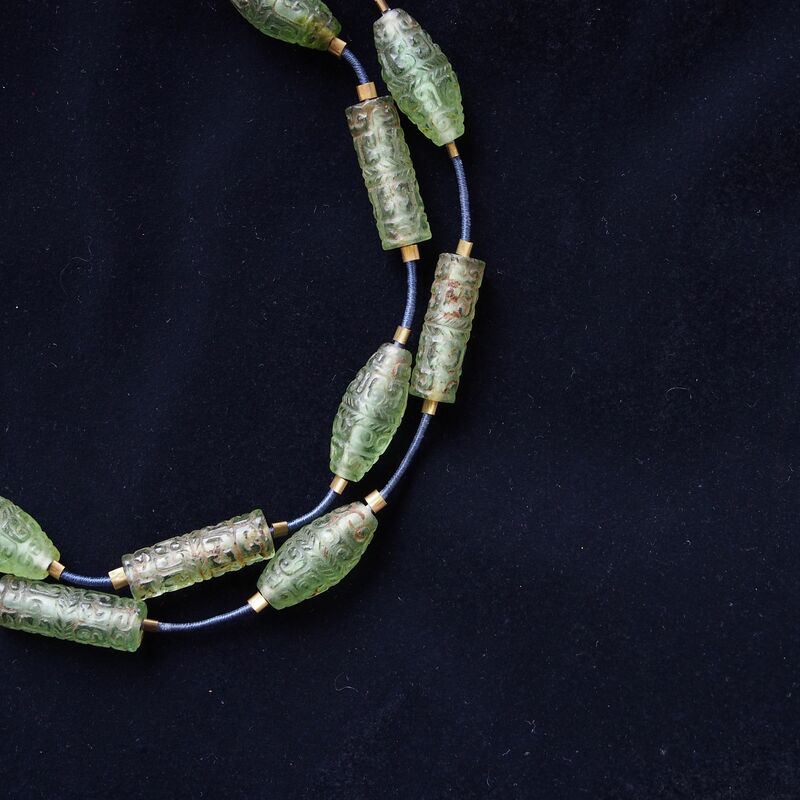 This necklace is made up of piece of a hetain jade (nephrite) huang, tied together in the fashion of the famous jade armor. 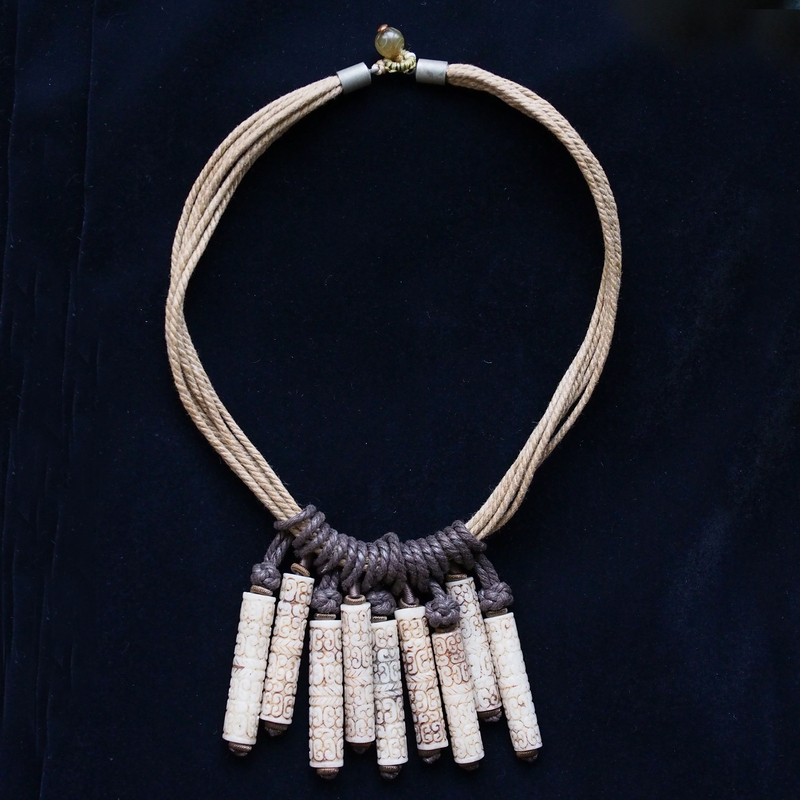 The pendants of this necklace are called Yu Le Li and they are believed to be a cousin of the bracelet! 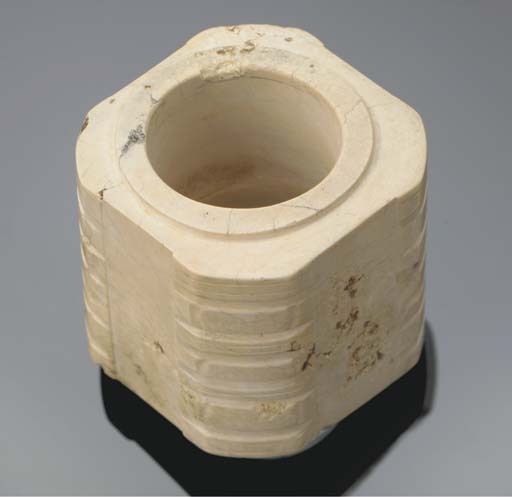 Many many years ago, Yu Le Li was a jade cylindrical tube used in the ritual ceremony for demon cleansing. 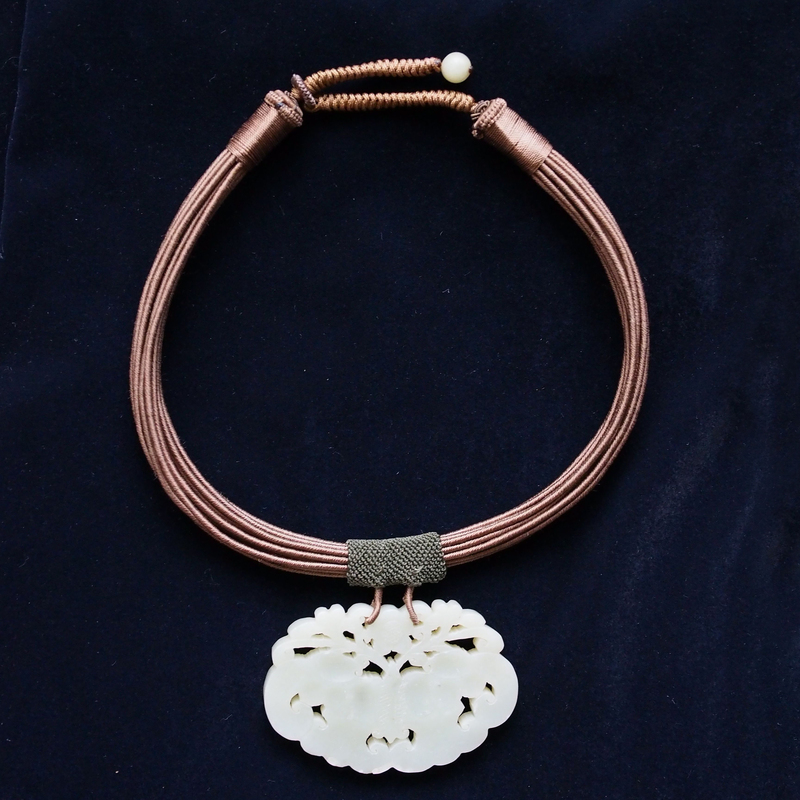 As times goes by it was developed into the form of the bracelet and also as a waist pendant. 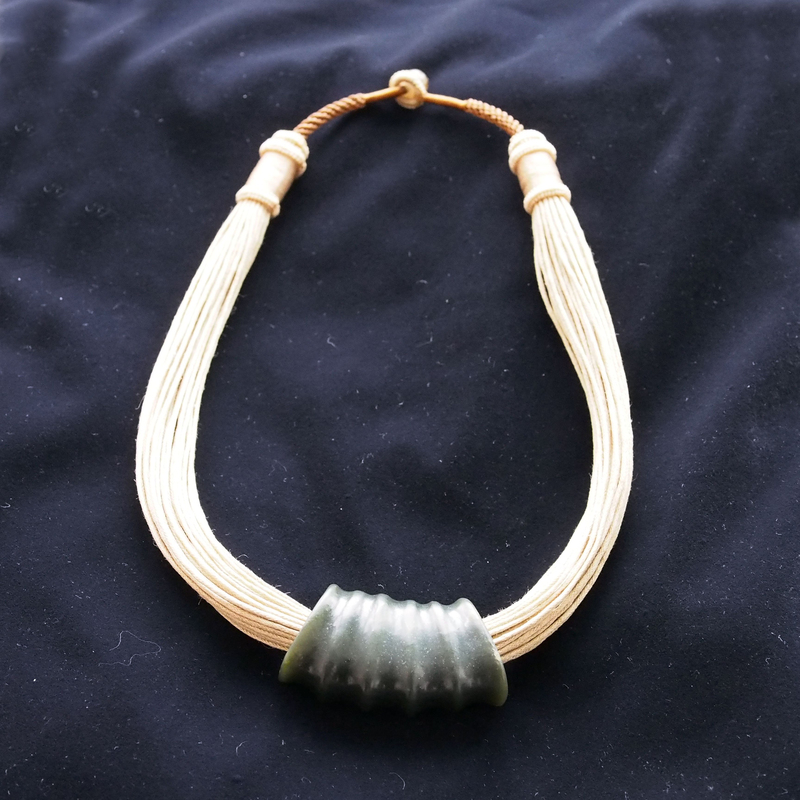 The small pendant form is now used in this necklace. 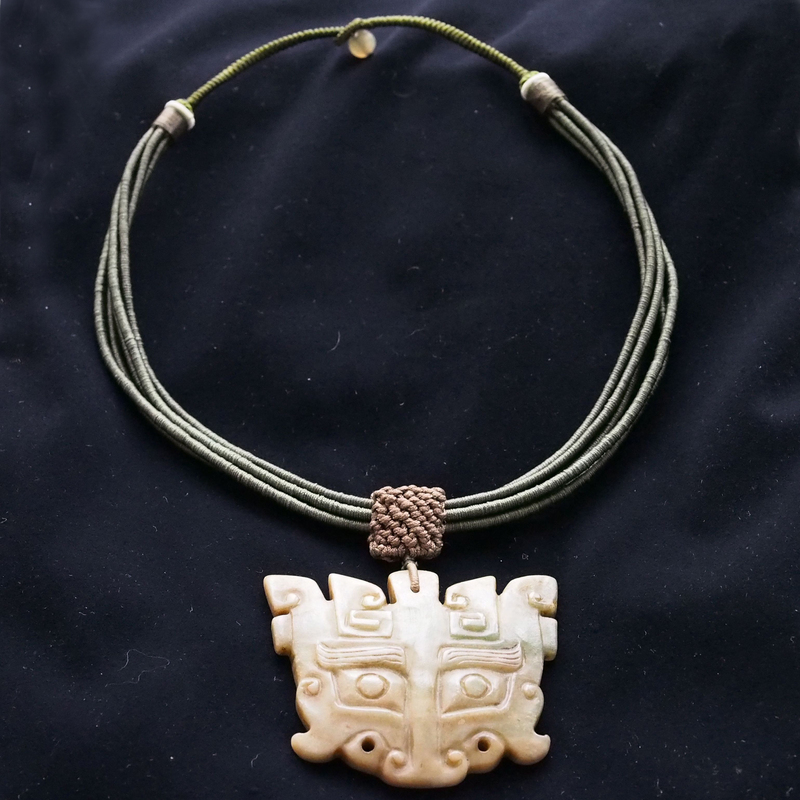 The pendent for this necklace is a jade head piece. The idea of a headpiece comb developed very early in China; the word “beauty” 美 came from a goat 羊 hat over a dancing man 大 (a man 人 with his hands extended). The concept of head gear developed into a social etiquette, a complete system was formed for ranking of officials, classes and for different occasions. When a young noble male reaches the age of 20, there will be a crowning ceremony, signifying the change from a boy to a man. 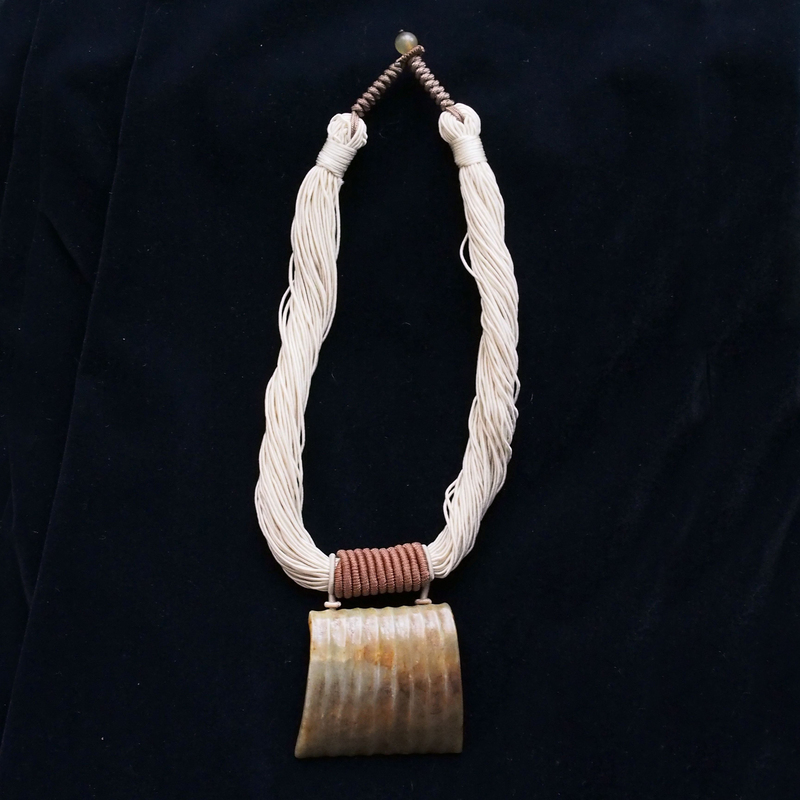 Some head pieces are secured on the hair bundle rather than as worn as a hat and this pendant is one of them. Before looking into the subject, I have always thought that 琉璃 “liu li” is only a posher name for glass 玻璃 “bo li”. Unlike the ordinary glass “liu li” is a precious material, one of the 7 treasures of musaragalva, agate, liu li, amber, pearl and musk. “liu li” is in fact a totally different material and is produced with an entirely different technique. The technique of “liu li” production has been used in China for over 2000 years, it is believed to be an accidental discovery during early lead making. In the process of making oxidized lead, a glaze like substance is found to be attached to the clay kiln, a further firing of the glaze with quartz became the early formula of liu li. Unlike glass, “liu li” is opaque and formed by a laborious task of casting and sanding.